Hanapepe means “crushed bay”; perhaps so named due the landslides in the valley or the appearance of the cliffs from the sea to the rocks surrounding the deep bay area. 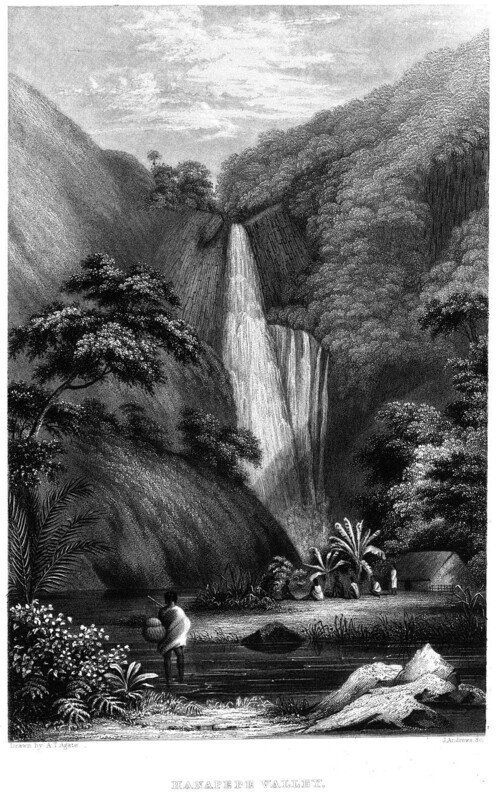 The native people of Hawai`i, Kanaka Maoli, inhabited the lush valley of Hanapepe for centuries before Captain Cook arrived in 1778. Hanapepe Valley is a fertile area, where many foods such as banana, sugar cane, and sweet potato were grown. Besides growing kalo, from which “poi” is made, Hawaiians developed salt, cultivated in saltwater ponds for trade with sailors. Salt trading was the earliest entrepreneurial legacy of Hanapepe. The right to harvest salt, handed down through families, continues today. The sugar industry flourished in the 1880's, bringing Chinese, Japanese and Filipino immigrants to the islands. Most stores and towns on Kaua`i were built and owned by the sugar plantations. Hanapepe, however, was built by entrepreneurial immigrants. Many who retired from the sugar plantations or could not adapt to their strict working conditions came to Hanapepe to grow taro, rice, or begin small farms or businesses to serve the local community. Labor union organizers in the early 1900's were welcome in Hanapepe. Workers in the first half of the century who organized to strike for better wages and conditions at sugar and pineapple plantations were not allowed to reside at plantation camps; strikers had to stay in independent areas such as Hanapepe. The nearby harbor had many longshoremen who had concerns about working conditions and safety as well. Today workers have better safety regulations, wages and retirement benefits due to the activism of previous generations. Hanapepe was one of the locations visited by the United States Exploring Expedition under Charles Wilkes; the expedition arrived in Hawaii in late September, 1840, and spent some time in the islands. It is one of the few towns on the island that was not created by the sugarcane plantations. In the 1920s, a deadly, historic, labor battle occurred, later dubbed the Hanapepe massacre. On August 27, 1980, Douglas Kenney, a co-writer of the film National Lampoon's Animal House, fell thirty feet to his death from the Hanapepe Lookout. The town was the inspiration for Kokaua Town, the fictional hometown of the main characters in the Disney animated film Lilo & Stitch and its related franchise (the town was not named until Lilo & Stitch: The Series). Hanapepe is the headquarters location for the ice cream company Lappert's Hawaii, as well as home to the westernmost bookstore in the United States, The Bookstore - Talk Story. those who come after us."